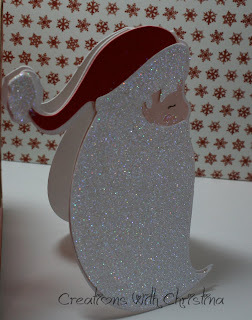 I used Santa from the Cricut Cartridge Joys of the Season and welded it together. I love this cartridge! Wait...haven't I said that about all my cartridges? Supplies: Cricut Expression, Cricut Gypsy, White and Red Bazzil Cardstock, Blush Blossom Stampin' Up! Cardstock, Dazzling Diamonds Stampin' Up! Glitter, black Pigma Micron 01 pen, and Pink Pirouette Stampin' Up! ink with blender pen for Santa's cheeks. Head on over to the Gypsy Spot to see what the other designers have created. That is so cute! Love the sparkle! Love it! Funny, I was just watching the card Joy made today at CWTC and I loved it too. Two beautiful and simple cards to start my day. TFS! Oh, I love this Christina! What a great way to sue the dazzling diamonds! Ohhhhh, this card is super cute! Love it, it's perfect. A Santa elegant enough to send to my grown up friends. Oh I love the glitter!! Another SLAM DUNK, Christina! This is so darn cute - I want to make one of these!! Just amazing!! LOVE YOUR beautiful creations!! This is a super cute idea. Great card. awwwwww he is sooooo CUTE!!!! i bet you have more glitter on you than his cute beard! LOL thanks for sharing another beautiful creation!! OMG, I absolutely love, love your adorable card!!! Very cute! Christina, I love your Santa. So cute. Oh my gosh, this is just too cute. Sure hope you can create a cut file. I would like to learn how to do that myself. Just love shaped cards and this one is no doubt very creative!! Thanks for shari. So cute! I wish I knew exactly how you did it! I would love to duplicate this! WOW!!! You are just like me i adore makeing everything shaped...i am really tired of SQUARE stuffno REALLYYYY! !..hahahah..LOVE IT!!!!! That's so beautiful! I should make something like that for my stepmother when I get that cartridge, she loves Santa, and it's SO elegant! Thanks for sharing! I love how you girls do the shaped cards. I just got my gypsy, so hopefully I can learn how to do that to, I need hands on. Love your blog! this is just too cute! tfs!